This wonderful book showed up in a library book sale and of course I grabbed it! I looked up some of the house specialties from Michigan. 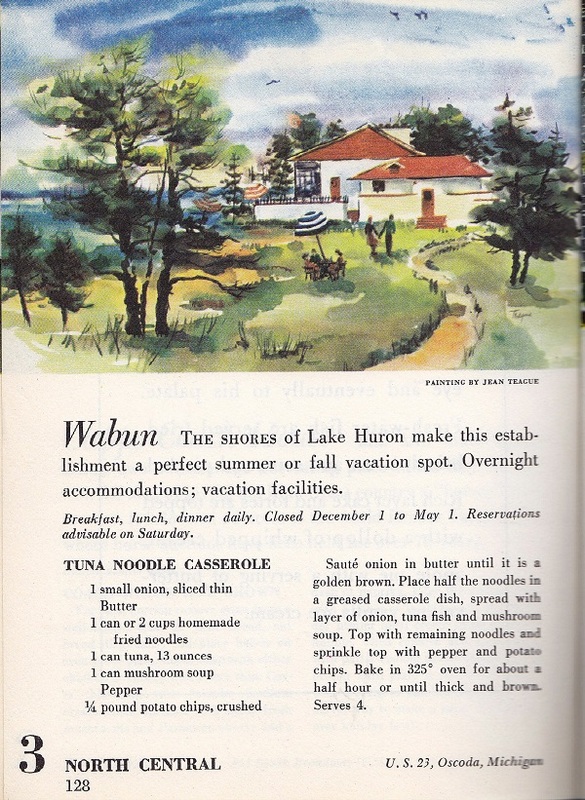 (I love the idea of going to Oscoda to eat Tuna Casserole.You would think they would feature one of the fish from Lake Huron as a specialty.) None of the places located in cities I was familiar with even registered on my radar with the exception of New Orleans’ Court of Two Sisters and Plymouth, Michigan’s Mayflower Hotel. According to WorldCat, there are some holdings in university collections and some large libraries which are probably appropriate places. As current travel information? Of course this is not helpful. As a culinary and marketing relic from the 50s, absolutely a winner. I’m going to have to make the shrimp au gratin! 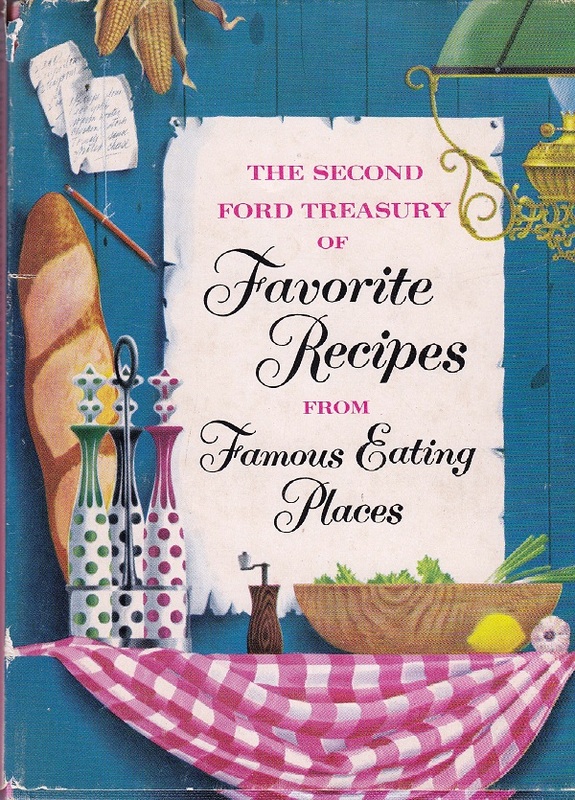 I really like old cookbooks, especially from “famous” restaurants so this would be a great find for me. 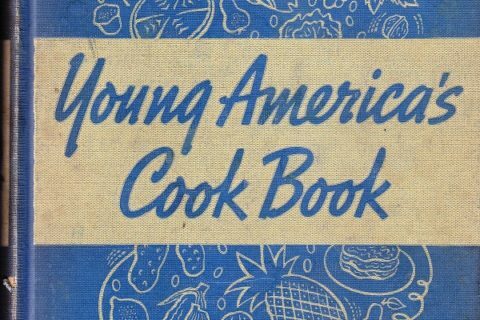 Two that I have are “Adventures in Good Eating” (1951) by Duncan Hines and “A Guide to Distinctive Dining” (1955) compiled by Ruth V. Noble. It’s interesting to see how food habits have changed as well as stayed the same and some of the places that are still around. Smoked Tongue or Stuffed Beef Heart, anyone? I collect old cooksbooks and really like the ones from famous places. Love seeing how food habits have changed and what restaurants are still in business. My “Adventures in Good Eating” (1951) by Duncan Hines is a great tour across the US at the time. Smoked Tongue or Stuffed Beef Heart anyone? Oh mom would love this. She collects old cook books. I love the drawings. It makes it somehow so much more appealing than the glossy food photos in modern cook books. To me at least. But I am weird. This reminds me of an old Mobiloil road/attractions map my grandfather saved for years. The principal “attractions” were colleges and state prisons/reformatories. NO idea about that one. Ah, I love recipes back before carbs and fats were evil……. 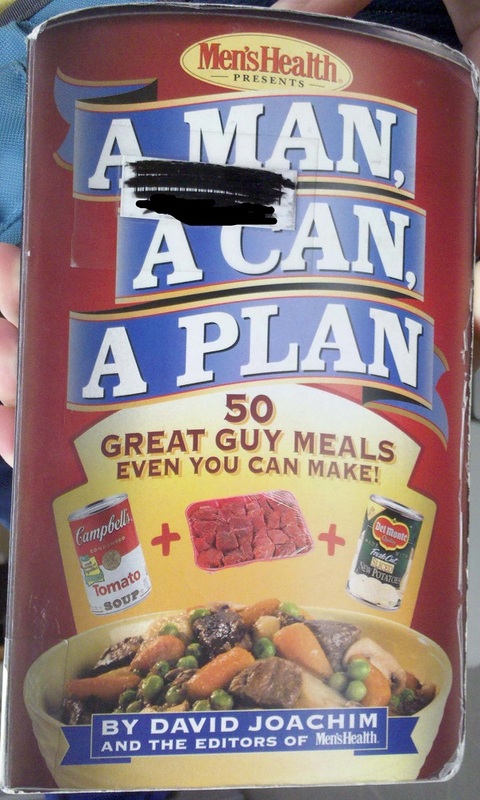 I actually own this cookbook. I found it at an antique/junk store. I proudly display it with my collection of vintage and antique cookbooks. 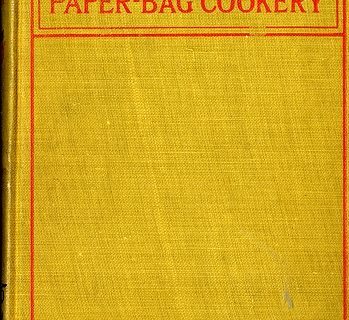 Our special collections cookery collection includes this book. Yes – ideal for collectors, not so much for other library use. Love that the Court of Two Sisters recipes mentions oleo…which is what my Mom still calls it most of the time. 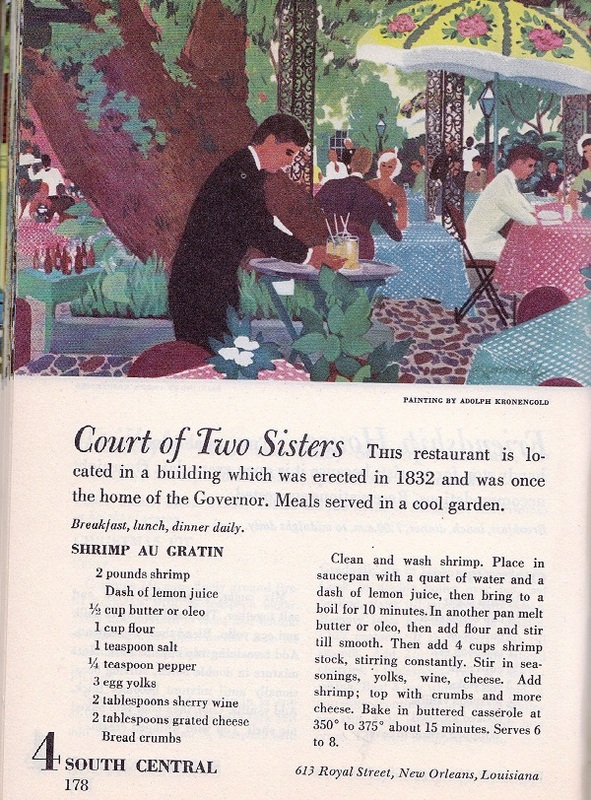 And @kata carbs & fats are still not evil in New Orleans & you can still eat at the Court of Two Sisters. To really get some OLD New Orleans recipes, check out Lafcadio Hearn’s Creole Cookbook, originally published in 1885. Now some of those recipes are really scary. Wait, what? Canned, fried noodles? Is that like those Chung King or LaChoy (I forget which, possibly both) cans of fried sticks? The good news is that at least the Court of Two Sisters is still there! It is a little “touristy” for me, but it is certainly a landmark. This is definitely ideal for collectors.. Thanks for the post. May I add A TREASURY OF GREAT RECIPES by Vincent & Mary Price (yes, THAT Vincent Price) to the list of wonderful vintage cookbooks? It was published in 1965 and was a fixture in my husband’s home when he was growing up. About 20 years ago, his mother found a used copy and sent it to us. The Prices write about their favorite restaurants (none of which, I believe, are in existence today) and provide recipes for their favorite dishes from each. We make Alfo’s Special (a garlic-shrimp pasta) all the time; and we use the recipe for fondue every New Year’s Eve. Plus the book is lovely to look at, with big color pictures and charming line drawings and fonts. 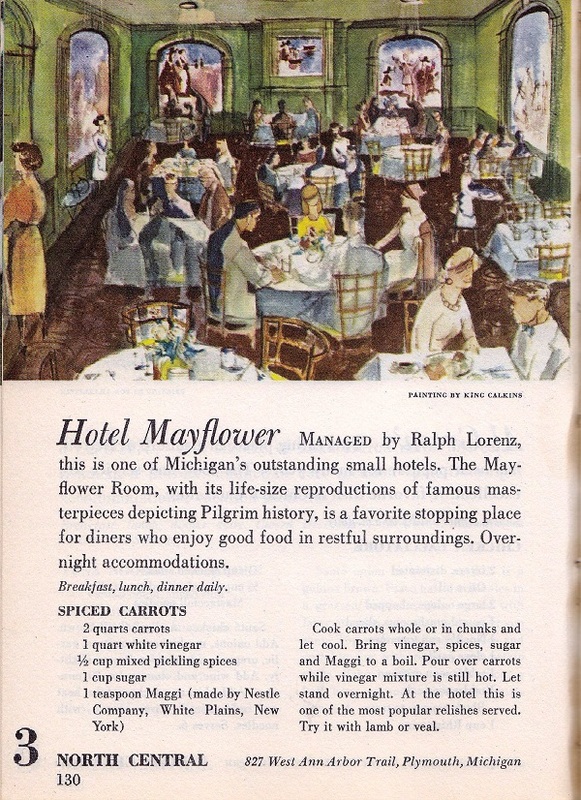 According to trueyellow.com, the Hotel Mayflower is still around too. Wabun resort, however does not seem to be. What’s the attraction for Massachusetts? I’m going to guess that it’s Durgin Park or the Union Oyster House in Boston. For Boston, my guess would be the Parker House. I don’t think Durgin-Park would be “classy” enough for this cookbook, and the Union Oyster House was in a “down” phase when this was written. But the Parker House (now Omni Parker House) has always been famous for Parker House Rolls and a few other things, and always been a Famous Eating Place. Just found your site. What a neat idea and I look forward to further exploration. I will hazard I am not the only person to copy the recipe for shrimp gratin.